Pumpkins rest on the stone wall today. Other hands built the wall, but I grew the fruit, in a garden plot a hundred feet or so south of the wall. There are less than a dozen of pumpkins; most are small, too small for carving. One small one, perfectly shaped, made it indoors, where it will serve as decor until the weekend after Thanksgiving, assuming it lasts that long. If I were to take this harvest to market, it would not bring enough money to justify the effort. At best, this crop is worth $8 or so. And what is $8 these days? The dirt I grew them in cost $200 for the load, and the seeds were 33 cents. I grew other stuff in the dirt, and dirt being recyclable, the expense is a pittance for such pleasure, for I enjoy pumpkins and their company. I like their variations on orange, smooth complexion, curvaceous forms and contrasting, crusty stem. I’ve not a single bad pumpkin memory, and that’s saying something, for by the time we turn 64, we’ve accumulated painful memories of most everything. From salad bars to blue cars; from Prairie Home Companion to Mahler’s First Symphony, I’ve quite a collection. But pumpkins? Not a bad one in the patch. Judging by the popularity of pumpkin-flavored beverages, soaps, scented candles and sweets this time of year, I am in good company in my adoration of Curcubito pepo. And while I am drinking pumpkin-spice coffee as I write this, I say let the pumpkin be a pumpkin, not a flavor (artificial, at that), color chip or scent. I even prefer my pumpkins au naturel. No face painting, no carving and no sequins or googly eyes. Born a pumpkin, died a pumpkin, not a Jack O’Lantern. And so I plant them every year, and hope to raise a crop worthy of the stone wall. That wall is one of the reasons I stay here, in a house and yard way too large for our needs. But Ruth and I find comfort in stone and wood. Truth of the matter is, this property is a lot of work, far from her job and the county real estate, city income tax and school income tax make this an expensive place to live. But we have enough to grown pumpkins and display the harvest on a stone wall come late September, then watch as oak, magnolia and oak leaves accumulate around them until only stems are visible. There is joy in all of that. I’ll never forget Ruth’s joy early in the summer when the first orange horns appeared on the vines, followed by the fruit. One, in particular, showed great promise, and she beamed when we pulled back the prickly leaves to reveal the perfect form taking shape in the compost. It’s hard not to love a woman who gets excited about a pumpkin being born. 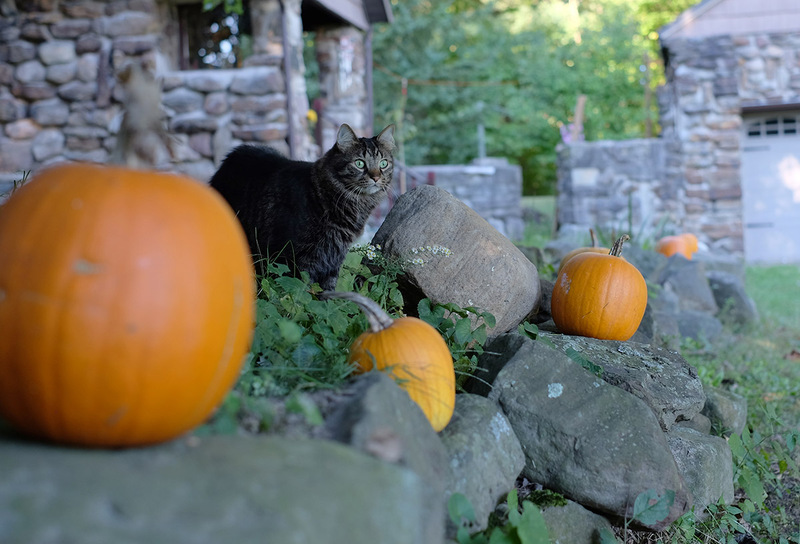 We had not gotten around to the pumpkin topic when we were dating, and so it was with great relief that I discovered she enjoys the company of a few good pumpkins as much as I do. She approved my exhibition of the crop, as well. Lined up on the wall, our harvest is safe from pumpkins smashers and thieves. I can see their noggins from my office window. And down the hill, in the enclosure where they were born and raised, their vines are brown, dry sinew, ready to be discarded. I procrastinate; I would much rather harvest pumpkins and line them up on a stone wall than deal with the withered umbilical cords. And so I wonder if we subconsciously associate the shape of pumpkins with the womb, and thereby find comfort in their presence? I wonder they take us back to that singular season of gestation? If these premises be true, I wonder why some smash and carve pumpkins, while others are content to place them on stone walls that other hands built?